This session was made up of three mini-sessions covering different aspects of SEO. First, Wil Reynolds, the founder of Seer Interactive, spoke about content, brand, and attracting customers. He started with saying that understanding how people make decisions is a skill that is un-distruptable. He believes that it is a greater skill than understanding how Google works and stressed that knowing everything about the Google Panda algorithm update or Penguin wouldn’t get you what you need. We have to understand how people and psychology works and then we can apply what we know about Google on top of that. You have to ask yourself: How would you solve my clients’ problems if you didn’t control their search? Where are you putting the algorithm before the people? It’s time to remember that algorithms don’t buy stuff, people buy stuff. You might be winning at search but still losing people. You have to think about what people need, what their frustrations are, and then answer it with great content. It’s simple — produce the content that solves their frustration. Wil provided an example of Airbnb, which produces great content. When looking at Google trends, the term “Airbnb London” actually had significantly more search volume than “vacation rentals London.” This was due to airbnb producing engaging content. Airbnb pleases its customer with content, and the results show how well it works. He closed with these thought-provoking questions: Is your content strategy building trust? If your content was missing from the internet, would anyone miss it? 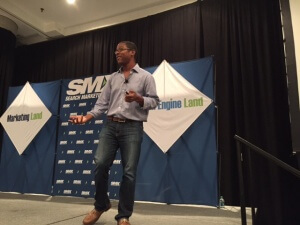 Next up, Marshall Simmonds, founder and CEO of Define Media Group, Inc., spoke on dark search and dark social. If you’re wondering why your traffic dropped or increased, but you can’t figure out why, it’s possible the answer is dark search. Marshall Simmonds talked about how shifts in dark search, direct, social and mobile traffic have changed and how we need to adjust and interpret our new normal. Dark search is basically traffic that you don’t know where it came from because there is no attribution. Direct traffic is traffic from people who bookmarked or typed the url in. Many times, dark search will be attributed to direct traffic. Unfortunately, there is a lot of misinformation in our industry. Lots of companies will give misinformation about where their traffic is coming from. He cited comsCore, stating that only 60% of search traffic came from Google while 20% was from Microsoft; however, his data was completely different and showed the majority of his search traffic coming from Google. Thus, he warned us to be aware of this type of misinformation. How Do You Find Your Dark Search Traffic? 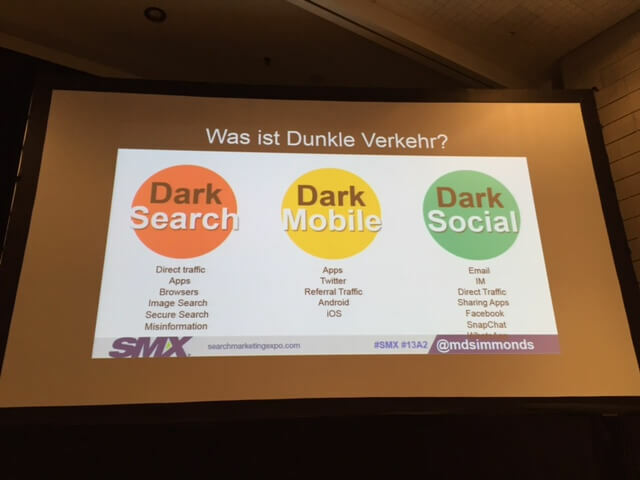 Marshall provided a great formula for finding your dark search traffic, which can be seen in the image below. Facebook has introduced publishing, which has released a huge load of content in all of our Facebook feeds, but it doesn’t have tracking set up. Facebook is working on fixing its tracking, but in the meantime, it is still obscuring the data, so you’ll have to calculate what percentage of your traffic is dark. 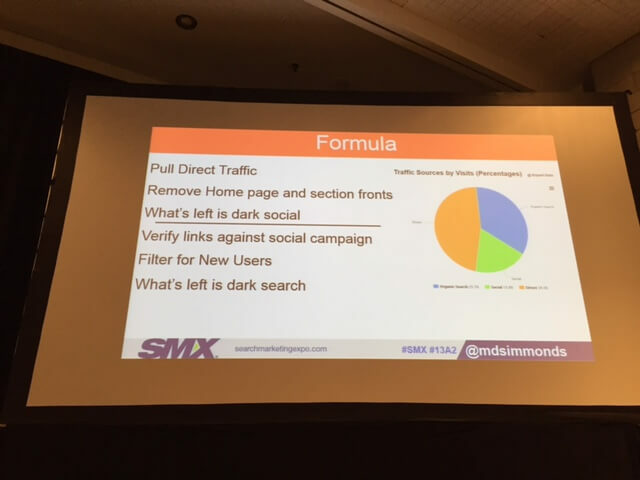 To find your dark social traffic, marketers have to pull direct traffic, remove the home page and section fronts and what’s left is dark social (the first two steps in the formula above). iOS, Google Apps, and Chrome accurately pass referral traffic; however, the Android search app passes referrer traffic as direct. Thus, you need to be aware of this when looking at your mobile traffic. Lastly, Adam Audette, President of RKG, explored audience understanding, the role of content in eCommerce and a few key points on technical SEO. He covered what he considers to be the two pillars of SEO: technical & audience. Always be looking for ways to create great experiences for consumers. Your content strategy starts at the SERP. Really think about when you use schema and only use it when the customer would want to see it. Adam had a client that accidentally had a video show up for a product page in search results. You’d think that the CTR would have skyrocketed, but it didn’t. Instead, it had a much lower CTR than when the video thumbnail didn’t show up. What this tells us is that people didn’t really want to see a video thumbnail, they wanted to see the product. There are a few higher-priority areas of technical SEO that Adam quickly pointed out that we should keep in mind when looking at SEO. Duplication: typically a lot of e-commerce sites will have a lot of duplication issues at the product level. Always crawl the site yourself to check it and look for those duplicate pages. Want to know more about what’s happening at SMX? Follow me on Twitter to keep up with the action @ivy_lustig.